Alter chef Brad Kilgore offers "food with no boundaries" at the cultural Adrienne Arsht Center for the Performing Arts. Coffee and eggs, offered all day, in downtown Miami. Eighties throwback lounge and tiki bar. The folks behind NIU Kitchen heat things up with neighboring charcoal-centric Arson. Ernie Els wine bar and grill, dubbed “Big Easy,” makes its way from Africa to Miami. All-American chow is on the menu at this Miami Beach hotel restaurant. Miami's first and only shipping container-based, full-service restaurant puts Florida meats on a fiery pedestal. A prohibition-inspired bar shaking things up in Coral Gables. Craft Social Club takes bottle service to the next level. Unique ice cream and sorbet flavors in Miami's Wynwood neighborhood. Numerous arepa varieties, patacon, empanadas and more at this family-owned and -operated Venezuelan eatery. Japanese izakaya and fish market in Downtown Doral. 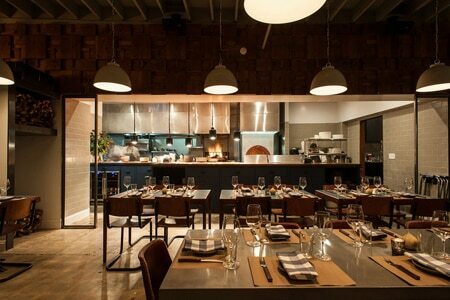 An Italian concept from chef Michael Schwartz at the SLS Hotel & Residences in Brickell. Ramen lovers can get their noodle fix at Ichimi in Coral Gables. Reservation only tea experience in Coral Gables. Food truck at The Wynwood Yard offering a blend of Japanese and Spanish cuisines, along with some Miami flavor. Neighborhood joint in South of Fifth emphasizing organic ingredients and clean eating. Steaks, seafood and sushi with a view from chef Laurent Tourondel on Ocean Drive. Chef Helene Henderson has brought her casual American restaurant to Miami Beach at the Nobu Hotel at Eden Roc. Dine in an outdoor “pod” at Miami Supercar Rooms in Wynwood. Authentic Greek restaurant in Fort Lauderdale turning out all the classics and then some, with a modern twist. Old-world concepts and authentic Peruvian fare but with a modern twist and Asian influences in Brickell. Get in line at this Wynwood shop for the freshest poke in town. Brazil transplant and 24-hour Parisian-inspired bistro in South Beach. Americanized Peruvian food in Downtown Doral from the guys behind Bulla Gastrobar. Build-your-own poke (sliced raw fish dish popular in Hawaii) bowls in Brickell. First U.S. outpost of Latin America’s Parador La Huella proffers wood-grilled meats, sushi and views of Brickell City Centre. Local, sustainable seafood shack and cider and mead bar at Mayfair in Coconut Grove. Classic Continental cuisine from chef Thomas Keller at Four Seasons Hotel at The Surf Club. Pan-Asian cuisine in the heart of South Beach featuring dim sum platters and sushi boats along with copious amounts of saké. Chef Cindy Hutson's seasonally driven island fare with a Miami twist at downtown’s Southeast Financial Center.